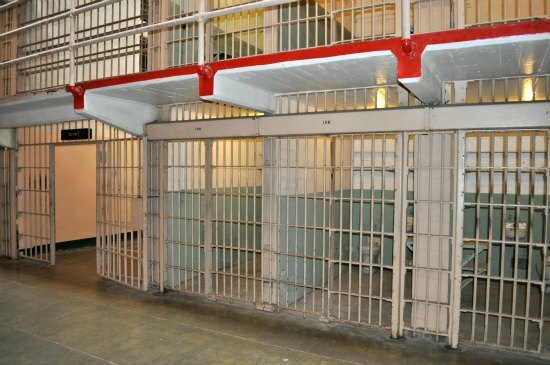 What to Expect from this Popular Tour of "The Rock"
The Alcatraz night tour offers a a more personalized option for visiting this top San Francisco attraction. This is also a great option for anyone who has already visited during the day and is looking to experience something a little different. I love visiting Alcatraz at night because the groups are smaller and the only people on the island are the people from your ferry. This way, you can get around quite a bit better and squeeze in more photos that aren't crowded with other visitors. This is one of the photos I took during my last visit. It's a rare look at the prison cells without anyone standing in front of them. The challenge with the night tours is getting tickets. They only run Thursday through Monday nights.In the summer, there are two each night; in the winter, there is just one. The best way to get your tickets for the Alcatraz Night Tour is to book them as soon as they are available which is 90 days in advance. Not only do they run on a limited schedule, but they also only allow a few hundred people per tour. This creates a more intimate visiting experience, but it also creates high demand for these tickets. The challenges above are also what make a night tour such a special trip. With only a few hundred people, they are able to open up restricted areas on Alcatraz Island, provide more guidance, and allow people to roam around a little more. After you get off the ferry, the Alcatraz night tour starts with a brief overview of what to expect given by one of the rangers. This is the same as during the day, but includes information on additional things to do that evening. As you walk up the hill to the main cell house, additional rangers are on hand giving details on its history and its infamous prisoners. During my last visit, they had a very informative talk about Al Capone (learn more about him and why he ended up here). will arrive as the sun is setting (or shortly before). This is from my last Alcatraz night tour - just as we got off the ferry. After two or three stops for these talks, you will reach the main cell house. This is where you will pick up your self-guided audio walk. It's the same 45-minute version you will find during the day. After you finish with the audio, you will be guided around to other open areas. During my last Alcatraz night tour, they opened some of the rooms in the medical area upstairs, where many prisoners stayed when they were ill. Rangers were also on hand to answer questions and provide additional information about these areas. On another Alcatraz night tour, we were allowed to tour the basement of the main prison - which was the original solitary confinement area. We were only allowed in with a guide, but it was an amazing look behind the scenes at this infamous prison. They don't publish which area will be open during these tours, but you can expect access to some areas that are not open during the day. While the times change a little each season, you can expect the first ferry during the spring, summer, and fall months (roughly March - October) to leave San Francisco at around 6pm. The second one leaves around 6:30pm. There are also two return ferries. The final ferry leaves around 9:30pm. This gives you plenty of time to visit the island. More pictures of the small crowds in the evenings. In the winter months (roughly November - early March), there is just one ferry. It usually leaves San Francisco around 4pm. There is usually just one return ferry that heads back to San Francisco around 6:30 or 7pm. Tickets go on sale about 90 days in advance. The only place to purchase these is directly through Alcatraz Cruises (find tickets). Book them as soon as you can, so you don't miss out on the amazing adventure! 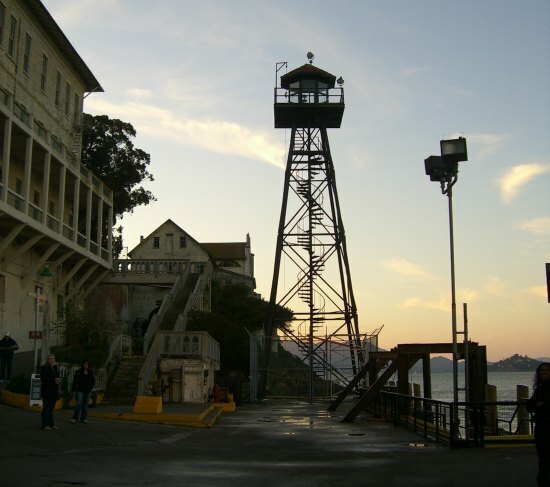 Your Alcatraz night tour will leave from Pier 33, which is an easy walk from San Francisco's Fisherman's Wharf district. 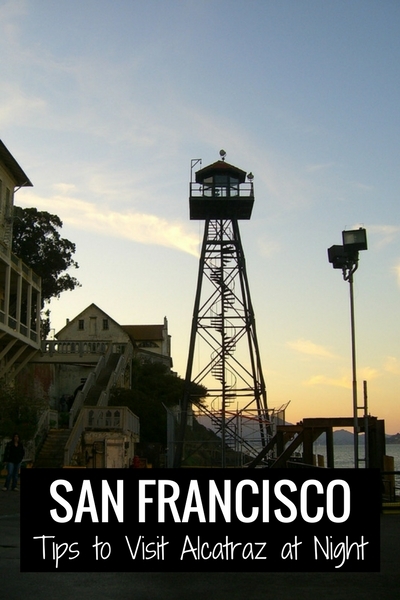 If you find that the Alcatraz night tour is booked or you would prefer to go during the day, then check out some of the great combo tour tickets available. The one I recommend often is the one through City Sightseeing. 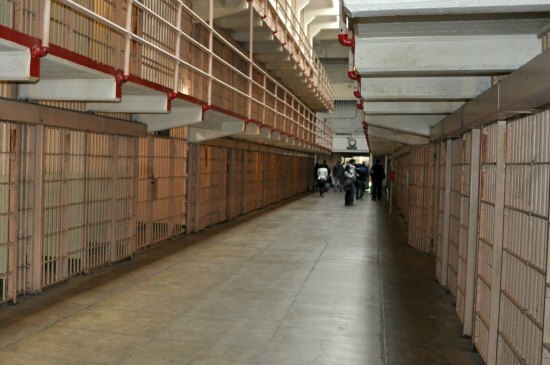 This Alcatraz tour package includes the day trip to Alcatraz as well as a 3-day ticket for their Hop On Hop Off Bus Tour. You can see several of our most popular attractions with the easy of their bus tour that takes you right to each one. Find out more about the tickets on City Sightseeing. Other combo tickets are available on Get Your Guide. They've created a round up of the best offerings from agencies all around town. Some include a visit to Alcatraz as well as a ferry ride to Sausalito, a wine tour, or a bike ride over the Golden Gate Bridge. Find their ticket selection here. How else can I help you prepare for our Alcatraz Night Tour? The Perfect Day at Fisherman's Wharf: What would I do if I only had one day in Fisherman's Wharf? Come along with me as I take you through what I consider the "Perfect Day" at Fisherman's Wharf. Walk along the waterfront as we visit the Hyde Street Pier, sample fresh fish at Fish Alley, and spend some time at the Aquarium of the Bay. This self-guided walking tour allows you to experience SF's most visited neighborhood at your own pace. Giants Baseball Schedule: If you love baseball, then you must catch a Giants game during your stay. The Giants regular season runs from April - September. On this page, you will find their current schedule as well as some tips for catching a game at Oracle Park (formerly AT&T Park). Save $$ with the SF CityPass: If you plan on visiting many of SF's top attractions, I recommend looking into the SF CityPass. This discount card includes admission to the California Academy of Sciences, the Aquarium of the Bay, and both the Legion of Honor and de Young fine arts museums. You will also get a 7-Day unlimited Muni pass (which includes rides on the cable cars as well as the buses and streetcars) and a 60-minute Golden Gate Bay Cruise. Comedy Clubs in SF: Head over to the North Beach district to laugh the night away. This SF district is home to several of the best comedy clubs in the area. SF attractions a number of noteworthy comedians as well as several funny locals. You can see them all here. Click the link above for the shows scheduled for the next few months.